The story of the Manthei family began the way all great stories do: with a strong woman. Constance Manthei began what is today the collection of Manthei family businesses. Coming from Germany, Constance and her husband Ferdinand settled in Northern Michigan with little more than a hope and a prayer to provide a suitable life for their family. She lacked a formal education but with a strong sense of faith and a vibrant work ethic that she passed on to her children, Constance taught herself to grow and sell aster flowers, which generated enough income for her to be able to buy a house and a car for her family. 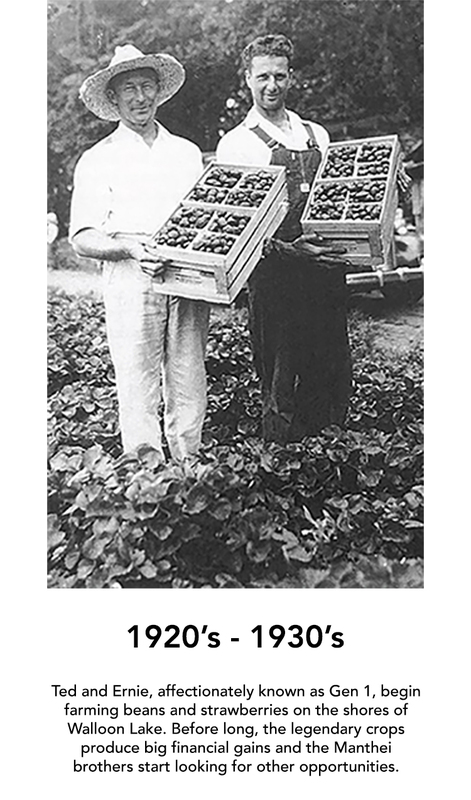 When her children, Ernie and Ted, came of age, Constance helped them get a loan from the bank (no easy task for a woman in those days) and her sons began farming strawberries and beans. As their innovative approach to growing, packaging, and selling agricultural goods led them to success, the two brothers began to pursue other business ventures. Today, with numerous companies in a wide range of industries located all across North America, the Manthei Group enriches lives through its diverse creations.